My dog Honey will NOT let us cut her toe nails. She is petrified. How can we do this? She is a therapy dog for elderly people and needs her nails cut on a regular basis. She has some anxiety issues. They arose after her brother Bear passed away this summer. She saw it. Could this have caused her anxiety? Please help us. We need to be able to cut her nails and don’t know what to do. Our vet suggested drugging her. We tried this and she was sooo out of it. Help!!! It sounds like this therapy dog could use some therapy herself! For this particular situation, I would recommend water therapy in the form of swimming. Since your dog is tense and anxious, your goal is transform this frantic energy into relaxed energy. Honey can do it; you just have to show her how! Swimming, particularly in warm water, can help your dog relax and also drain her energy. If you have a small dog, you don’t even need a pool. You can use a small tub of water. Simply hold the dog by the sides and let her paddle. If your dog is uncertain about the water, start by holding her on an incline, just let her bottom half touch the water. Wait until your dog begins to paddle with his front legs, and then you can slowly lower her front half into the water. If the dog begins to splash around and panic, calmly return the dog to the inclined position again – with the back half of the dog touching the water. Then once the dog relaxes and begins paddling with the front legs again, send her back in! Continue this until she becomes comfortable with the water. 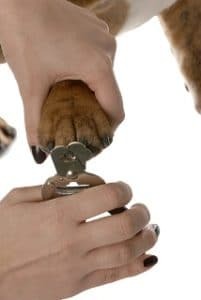 Once your dog has reached the lowest level of energy, begin by holding a paw and presenting the nail clipper to it without cutting anything. Then send her right back into the water to drain even more energy. At the same time, you are softening her nails, so they will actually be easier to trim. Then, after another round of swimming, you present the nail clippers again. This time cut a little bit, just to let her experience it and see her reaction. If she panics, send her right back in for more water therapy, but if the dog remains calm, do the whole foot – and then send her back into the water! This way, you’re not giving the dog time to focus on the nail clipping, instead she is focusing on the water. We are exchanging one challenge for another! Your dog can learn to associate the nail trimmings with the time in between swims that she gets to relax and collect herself. Keep repeating this process – allow your dog to swim, trim the nails, and put her right back in – until you’ve trimmed all four paws. I encourage you to visualize the scenario going well before attempting it. Don’t panic or feel sorry if your dog is stressed. Instead, make your dog feel safe by maintaining the calm and assertive energy of a pack leader. So You’re Thinking Of Getting A Siberian Husky?